It’s fall, y’all. I’m finally allowing myself to shop for fall décor. I’m a purist when it comes to waiting for a season to decorate…except when I’m hosting Thanksgiving and hang up Christmas wreaths outside before guests arrive. I just call that being prepared because I know the Thanksgiving food baby will prevent me. Anyway, I’m rambling about the end of November when October hasn’t even arrived. You know what I think is criminal? Halloween and Christmas decor on store displays in August. Could we not? I mean, seriously? Can we just enjoy the current season (as I just admit to hanging Christmas wreaths before Thanksgiving). Moving on. One of the saddest things I’ve experienced since moving to the South is the lack of changing colors, at least in the places I’ve lived: Savannah and Jacksonville. My heart longs for the beautiful reds, oranges and yellows of the trees back North. It’s something I’ll never ever stop missing. Since there are palm trees and evergreen scrub oaks on my block, it doesn’t really make sense to decorate with the traditional fall colors inside my home. Plus, lots of colors overwhelm me, and I’m happiest with neutral décor with just pops of muted colors throughout the home. I thought I’d share with you some glorious autumn décor ideas I’ve saved on on my Fall/Autumn Pinterest board. I adore this tablescape. What an elegant way to honor the harvest. 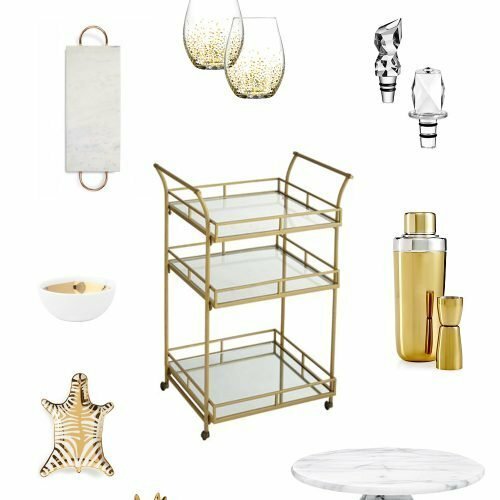 I already have mercury glass candle sticks, and the rest of the tablescape is pretty simple to recreate. Simply beautiful! I have yet to share with you my photos from Spain (seriously, how has a year gone by?!) but in La Mancha there were gorgeous fields of wheat. I love the satin ribbon and adding other elements, such as Spanish lavender or feathers, adds visual interest and glams up the wheat. I hear Hobby Lobby might have wheat bundles in their stores so I might take a stab at creating this this weekend. Also, On Sutton Place has a DIY wheat wreath tutorial that is worth looking at. Ann Drake of On Sutton Place created a beautiful wreath for autumn that is neither ostentatious nor dowdy. Even better, she repurposed a previous wreath also made by her (instructions here). I have a nice wreath I bought from Ballard Designs for Christmas last year that would make the perfect base for this wreath (not currently on their site but here’s the matching garland). All it has are pinecones, and I bought it like so because with a red bow it becomes a Christmas wreath. Plus, the quality is amazing and it withstood the harsh sun that bleaches my other window wreaths. Also, who thinks of repurposing twigs from tree pruning as fall decor? This genius woman, that’s who. What fall décor are you loving? That neutral pumpkin centerpiece is so pretty!